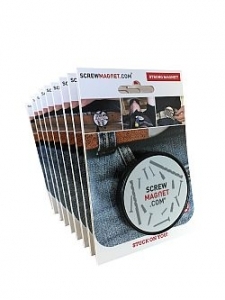 Screwmagnet not only magically attracts screws and tools, the Promotional Gift Award 2018 couldn’t resist the strong magnets of DG Trading either. The practical assistant for tradesmen and DIY enthusiasts can easily be attached to one’s trousers, belt, jacket or shirt thanks to an integrated clip or simply carried in one’s bag. Metallic parts like screws and bits stick to the surface, so they are ready at hand fast and thus don’t get lost. Thanks to the item’s load-bearing capacity of up to 11 kg, it can also carry heavy tools such as hammers, pipe wrenches and co. making sure they are always within reach. However, the strong magnet didn’t just win a distinction in the category Communicative Product for its high practical value – its customising options are also impressive: Large-surface logos and motifs can be applied to the “business magnet“ and the respective blister card can be individually designed.